"Julie Langsdorf mines wit from the ways that people manage (or don't) to live in close proximity. Her smart, enjoyable suburban comedy is observant and knowing about social selves and hidden selves, and the ways in which they are sometimes made to overlap." "A smart, riveting look at what happens to a community when competing visions of the American Dream collide and combust. 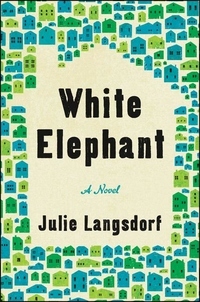 Langsdorf is a keen observer of human frailty and desire and her characters are darkly funny, recognizably exasperating and deeply memorable." "Lively and entertaining.... This ambitious and intriguing work about the American suburbs is perfect for fans of Ann Patchett or Meg Wolitzer." The White Elephant looms large over the quaint suburban town of Willard Park: a gaudy, newly constructed behemoth of a home, it soars over the neighborhood, dwarfing the houses that surround it. When owner Nick Cox cuts down Allison and Ted Millers' precious red maple--in an effort to make his unsightly property more appealing to buyers--their once serene town becomes a battleground.